What is a Country Tightwad? The cantaloupes in my garden are all coming in all at once … as those tasty orbs so often do. So the questions becomes, what do I do with them? Like … immediately. Time is of the essence. I tried a recipe a couple of years ago called “golden nectar.” It was a canned mixture of juices including liquefied cantaloupe. I actually hated it and wound up pouring it out for my chickens. I have also frozen bags full of cantaloupe in past years, and it has always been a tasty treat in the winter. I plan on doing several gallons of cantaloupe chunks this weekend, but that is a post for another day. But after doing a little research I decided to give my my brand new Excalibur 3900B 9-Tray Deluxe Dehydrator a try. And since my melons were kicking into hi-gear ripening mode, I had to move quickly. 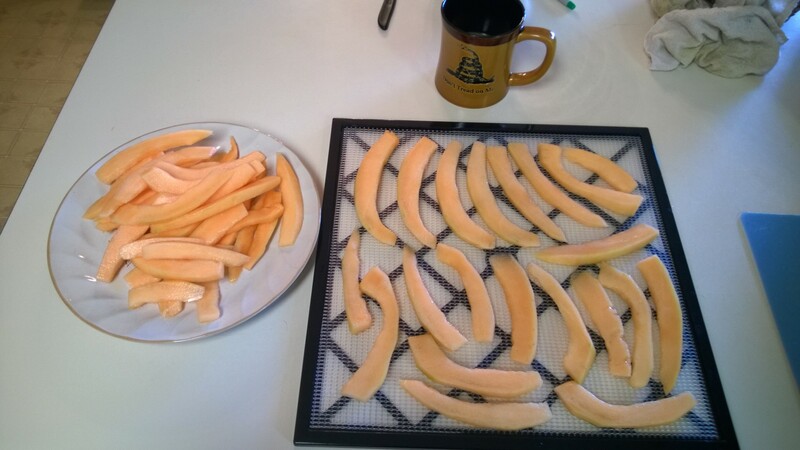 I simply cut, cleaned, and peeled my melons and sliced them into thin slices, roughly 1/4 inch or less. Then it was a matter of simply placing them on the non-stick sheets. Slices are spaced to allow adequate air flow. It took roughly four melons to fill up almost all nine shelves in my machine. I did have a little bit of loss due to some soft spots and cracks. Recent heavy rains made some of the cantaloupes swell rapidly and crack open. I was careful to excise any questionable spots. But even the scraps, soft spots, seeds, and pulp (i call them the “guts”) are consumable … in the chicken yard. I simply take them out back and toss them to my ridiculously pampered and spoiled hens. 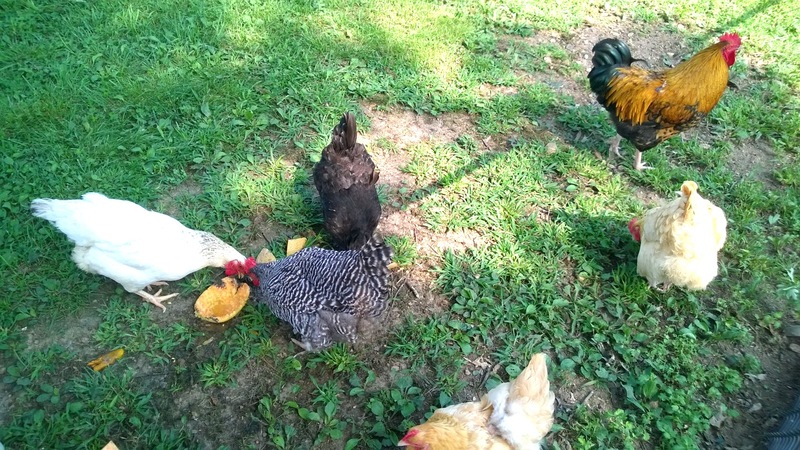 Even my rooster, Abraham, got in on the action! But the key for a country tightwad is that absolutely nothing goes to waste. All livestock-edible waste gets converted into tasty eggs. The skins and peels go right into the compost bin. Abraham is watching over his ladies enjoying their fruity breakfast. 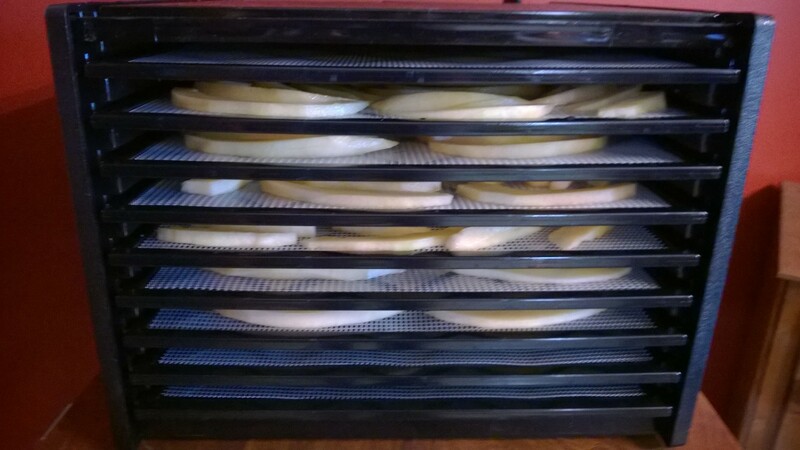 An almost full dehydrator of sweet, garden fresh cantaloupe! 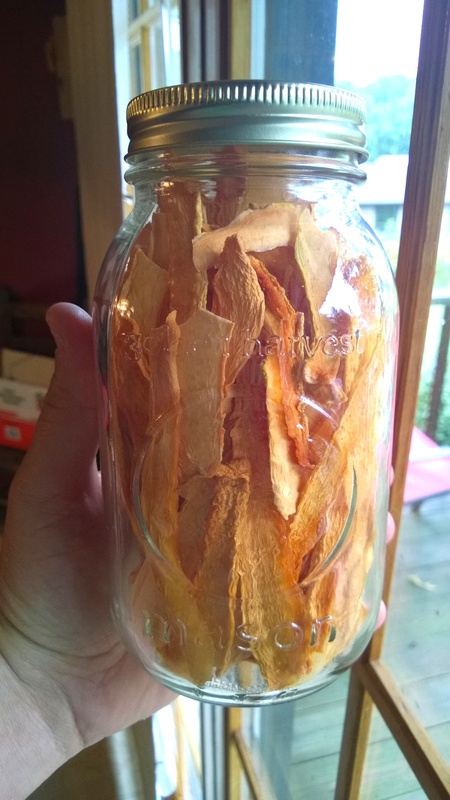 I let the dehydrator run overnight and by morning the fruit was good to go. Each little “razor blade” of cantaloupe is packed with an explosion of sweet freshness! The finished product was ready to pack in a mason jar. It amazed me that a single jar held almost four entire cantaloupes! I added a couple of silica gel packs and an oxygen absorber, and they’re ready for storage. They will be a welcome taste of summer during the coming cold winter. Orange shards of tasty Summer! Since we have so many melons coming in right now, I’ll most likely dry another dehydrated batch. I’m going to explore around the web and see if I can find any other flavoring additives or options. If you know of any, just add a comment!